Meeting the complete stranger, jewelry designer Johanna Methusalemsdottir of Kria, did not turn out like any other conventional get-together. Instead of awkwardly clicking tongues seeking for the right words, or perhaps the right gesture, it was like hanging out with an old friend. 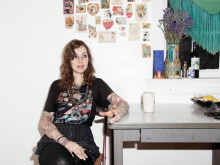 Born and raised in Iceland, she made her way to NYC twenty-four years ago and now calls Brooklyn her home. Our first stop was Johanna’s colorfully decorated Brooklyn apartment that she shares with her youngest daughter, Lola and husband, Paul. Her home and studio is inviting and cozy, filled with artwork, collectibles, R&B records, vintage finds and the sweetest hand-crafted postcards from her eldest daughter, India, who is also her muse & look book model. Originally inspired by the Arctic Tern from Iceland, Kria jewelry is a perfect blend of lovely bones cast in sterling silver, brass fused with delicate chains & beading to create pieces with an organic and primitive feel. Though she’s armed with a laundry list of creative work experiences and talents, she credits her family, friends and the Icelandic people as her biggest supporters and source of inspiration. After hours of chatting about the importance of tradition, nature, and the inevitable excitement born within new endeavors, we wrap up the day with a trip into NYC’s Jewelry District, where Johanna takes us through a typical workday bouncing between casters, polishers and setters to work on her new collection. I moved to New York in January 1988. Twenty-four years to be exact. I went directly to New Haven, Connecticut as an au pair. It was the easiest way to deal with the transition without too much hassle. But I didn’t last that long there. I left to Manhattan, pretty much six months later and moved in with my sister on Avenue B between Twelfth and Thirteenth Street. It was incredible. Some taxis wouldn’t even go there. It was kind of special, yet rough. We simply thought it was an exciting time. Before you were designing, you started off as a stylist? Yes. I did. Well, I did an internship with Me & Ro when I was pregnant with India, so that had to be around ‘92. Before then, I was just working at flea markets and restaurants. Everything was very easy going. After Me & Ro, I did some press work for Patrick Cox, and following that I ran a showroom called Skirt, which basically resembled couture. That was really fun. Then, I began styling. I was a freelance stylist until I couldn’t deal with the politics anymore. At least for me, it’s just not where my heart is at – I don’t breathe fashion. So what got you into jewelry design? I think I’ve always had a passion for it, even as a little kid I used to play with a lot of clay and other such things. After Me & Ro, I started making these rosary beads. Religious items were on them but I didn’t necessarily use crosses or anything similar. Regardless I’ve always liked beaded stuff and I just started doing that. It wasn’t until 2006 or 2007 that I found a skeleton on the beach and decided to use it without putting any thought into business. I just started making jewelry with the idea that this would be my first sort of project. Those pieces were from Iceland, right? Cool. I also remember you mentioned some pieces from Maine. Are you mostly influenced by all kinds of animals and water creatures? Yeah, some of them are dogwood branches. I think that’s the only sort of non-animal. But I pretty much use anything that I see that could be cast; comes from nature and could look nice on your body. I don’t have any limits really. What was the particular fish from your collection? It was a codfish. It is a staple in Iceland. It actually created a huge war between Britain and Iceland. It’s quite interesting and sort of sustained my culture. My dear friend sent me those (codfish) bones and it just happened to be that I realized that it was relevant to bring it up. I do draw much inspiration from my culture. Can you talk about the work you did in Iceland and what you did recently with the store Aurum? I went home last March for Design March, which is basically an art fair for the lack of a better word. It goes on for four days with different kinds of artists and accessories designers. A week later, Icelandic fashion week began, where you can introduce your work at this one store I used to work at. They are now one of my biggest supporters. They invited me to do an introduction of my new jewelry collection. So, I got a sponsor and decided to go for the event and it went really well. I received some nice coverage and it was great to meet the people who wear your pieces. Normally, you don’t necessarily know who they are and I’ve always wondered what kind of people wear my jewelry. It turns out all sorts of people wear it. What was the installation you did? I did a snake-like creature. I was part of the Nordic Fashion Biennale in Seattle at the Nordic Heritage Museum. My very good friend Shoplifter, who is an artist, invited me to take part in it and basically said that there were no limits or rules and I could do whatever I wanted. The installation didn’t necessarily have to be a piece of jewelry, which I thought was super exciting because I never really considered myself an artist. I started to figure out what I wanted to do and then India, my daughter, gave me this muskrat skull. So I cast it in brass but took the teeth out, and cast them separately in sliver. It had this enormous tail made out of fifty codfish jaw bones. Then I lined them up and in the end it had a foot long tail with claws and a bunch of crapping. It is some sort of a mystical creature. It was part of an installation in Iceland’s Hafnarborg named “Roots” this past summer. Did you have any formal training in silversmithing or was it a craft you picked up? I learned some wax carving, some setting, polishing, and soldering while interring for Me & Ro. I went to FIT night school when I was pregnant with India and learned more wax carving, which ironically I don’t do anymore. Maybe at a later point. We love how you use your daughter in the Kria look book. The pictures are beautiful. Can you tell us more and how you collaborate with your creative friends? I’ve always worked with the same photographer, Elizabet Davids. She’s a very good friend of mine. My good friend, Andrea, does the makeup. As for the styling, it’s really just our collaboration. I bring a bunch of stuff and so does Elizabeth and aesthetically we all get along very well. It has never been an issue. We of course have a concept for he most part before starting the shoot. As far as India…to me she embodies the beauty of an Icelandic woman – she’s kind of like a fairy or a mystical person and a big inspiration in my life. That’s why, for me, it makes perfect sense. She’s become somewhat my muse. Are there any new things you are working on that you can talk about? I’m ready with me new collection and will be introducing it now in September. It’s a continuation of the cod collection. Im continuing with brass, and to mix it up a little bit, I’ve made the silver completely black. Can you take us a little bit through your day? A typical workday is getting up between 7 and 7:30, then have Breakfast and get Lola ready for school. Around 8:15, when my husband and Lola leave, I go to my studio and start working, whatever it is whether I need to make something or not. When I’m in production, I go Midtown at least twice a week, sometimes more. The Jewelry District is on 47th St, between 5th and 6th. It’s where I work with Erol, the finisher, who I’ve been working with since I started and whom I’ve actually known for over twenty years now. Then I usually pick up my youngest daughter Lola and try not to go back on the computer. My workday goes from 7:30 to 3 o’clock. What do you think has been the most challenging or interesting aspect of running your own business? I didn’t really know anything about running a company. So that’s been very interesting, but it’s been a very fun challenge at the same time. I feel like I’ve really grown as a person . I’m kind of proud of myself for having done it. I don’t have a crazy overhead and I have kept it relatively small including my husband, Paul and I . The only thing is that it does take a little bit of time away from the creative side and drains you a bit. You’re very much a hermit in your own world when you’re designing at home, and sometimes don’t receive a lot of feedback. But now I am getting more and more responses for my work, which has given me confidence and inspires me to continue on my journey. You were recently featured in the New York Times. What kind of other feedback do you get regarding your jewelry? Thank you. It was super exciting. It was a perfect birthday present – The New York Times… people take it seriously. It was a validating moment for me. Kria is also being featured in the current September 2012 issue of Elle magazine which is already opening some doors. It seems like you’ve been running your life based on a deep instinctual basis? Yes. I don’t really plan anything I’m making too much. It’s really whatever I find. I look at it, and the first thing that comes to mind, I do. I definitely work on an instinctual level where I don’t over-think. As soon as I start over-thinking, I start doubting myself and then it’s not organic anymore. Also, not everybody likes wearing bones, that’s another thing. What kind of feedback have you gotten for you jewelry? There were just a few people who said for instance, “Oh! I would never wear bones, because I am a vegetarian.” To me that statement doesn’t make any sense because I am a vegetarian and I look at it more as a celebration of someone that died for whatever reason. I celebrate the shape of the body and create something you can adorn yourself with. But if it’s not your cup of tea, it’s not your cup of tea. How long have you been living in this Brooklyn apartment? I have been living in this apartment for 20 years. Unless I get kicked out, I’m never leaving. I have a feeling I’ll always be in NY…I love it here. To balance it and not to go completely insane we are planning to get a place upstate. When I’m an old lady, I’ll just be there growing vegetables. Where is your usual hang out in Brooklyn? Prospect Park is my usual hang out. To be in nature… That’s why the park is so important, in order to see open space, the sky and trees, hear the birds. It is the act of not constantly being. I also like going to the Red Hook Pool in the summer, that’s another Brooklyn moment. And then of course Coney Island, which I visit frequently. Coney Island is just magical. For one, because of the amazing people watching and it is still relatively untouched. Me, Paul and Lola go there somethings to dance to the Coney Island Dancers which is so much fun. Did you spend a lot of time on the farm growing up? Yeah, that’s where I spent my summers as a kid.Getting up early to get the cows and feed them. I went to the farm from when I was six until I was probably 13. Then puberty hit and I was completely lame and thought it was not as interesting any more. But I have a lot of great memories from that time. We played games with lots of animal bones. In Iceland, around February, we eat it when we are celebrating the God’s Thor and Spirit Gods. Ram testicles, ram testicle jelly, cow tongue, sheep’s face are all part of our bizarre menu, but it is something normal and natural to us. Thank you so much for the interview, Johanna. And if you want to find out more about Johanna and her jewelry label please check the homepage of Kria. This portrait is part of our ongoing collaboration with ZEIT Online who presents a special curation of our pictures on their site. To look at the special picture selection, click here.